AVO XO SeriesThere are 11 products. This series truly merits its XO label, the mark of the highest quality. A Small Panetela with a 34 ring gauge. The Robusto format in the AVO XO series. The Avo XO is the cream of the crop from this factory. 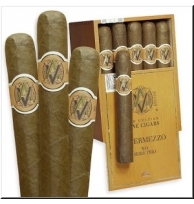 The AVO XO Maestoso is a majestic Churchill format. A Corona format in Tubos in perfect harmony. This Corona Larga format is the introduction to the world of music and cigars in perfect harmony.